May. 24, 2013 6:00 p.m.
Robert, a 1970s sweet bachelor, and his closest female friends in a great musical comedy, COMPANY by the Leduc Drama Society. City of Leduc – Local talent was once again showcased in a funny and musically awesome production of the Leduc Drama Society. This musical comedy, titled ‘Company’, is based on a book by George Furth, and the music and lyrics were composed by Stephen Sondheim. John Price was in his director debut, showing spirit, grace and fortitude throughout the four months of rehearsal, costume designs, choreography, financing and marketing… The play is indeed very funny, with some ‘mature content’: not so much the actions, but the language can offend some, but was shared briefly, and lost in the awesomeness of the voices in this witty and talented cast. As shared by Len Marshall, LDS president, this is the final production of the 2012-2013 Season. 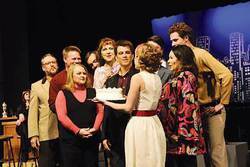 The cast was a nice blend of long-time members of LDS and talented newcomers. Len looks forward to the first production of LDS’s next season, the “Kitchen Witches” which will precede an impressive program for the 2013-2014 Season. “Company” offers sixteen musical pieces throughout its two acts. Fast-paced and laced with hilarious moments, displaying some authentic dress of the era, the highlight of the entire play was the incredible talent of these musical performers, supported by a live four-piece band, right on the stage! Some of these pieces were group performances, while the solos were amazing and very well received by the audience. An attractive feature of this play is the clever, ever-changing stage décor: furniture gets moved around quietly and efficiently, spotlights are used appropriately, and the musical numbers take place in various corners of the stage sets. Congrats to Leanne Hiebert, the Stage Manager. KUDOS are offered to Karen Lake as the Band Leader: the music in this play was indeed superior, quite enjoyable, and memorable! CONGRATS must also be offered to the entire Leduc Drama Society Production Crew and Cast. I am tempted to go catch this play once more, to revel in its charm and humor, as they will have a couple more performances, May 15-16-17 (Tickets available @ Gifts Solutions on 50th Avenue in Downtown Leduc). I hope they all get a restful summer, and come back in September, ready to prepare a great new play for our enjoyment!